Adding online/electronic voting to elections is one of the top inquiries we receive at SBS. And now that Florida law allows Home Owners Associations (HOAs) to implement online elections, we’ve seen a wave of requests from the Sunshine State. Online voting is convenient for members and is safe and secure, as long as you choose the right election partner. 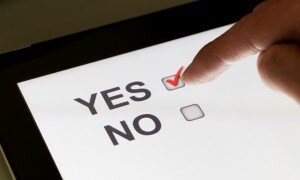 So, how do you know if electronic voting is right for your HOA? Your association spends a large amount of money designing, printing and mailing paper ballots. Online voting can be great for the bottom line. Elections are stressful for your organization and it’s becoming increasingly difficult to organize in-person voting and guarantee the security of paper ballots. Online elections require a lot less people power. The inaccuracy of annual hand counts, duplicate ballots and tallying is a concern for your association. Accuracy counts and electronic voting is automated and precise. Voter participation is low in your election and you may have trouble reaching a quorum. Online voting can increase HOA election member participation because it’s quick, easy and convenient. Check with your legal advisor and work with your HOA board to adopt a resolution and update the bylaws to include online voting. Follow any established timelines to submit proposed amendments to avoid delays. Expanding your HOA elections to include online voting is not a DIY task, so you’ll need to find a trusted election partner with extensive experience in online elections. Look for a third-party provider with many years of experience who emphasizes security measures such as exclusive names and passwords, an election website that utilizes TLS encryption and authentification, a modern web framework, data backup and strict quality control procedures. For more information about your HOA offering online elections or to find out if the technology is right for you, contact us any time. We’re here to help.